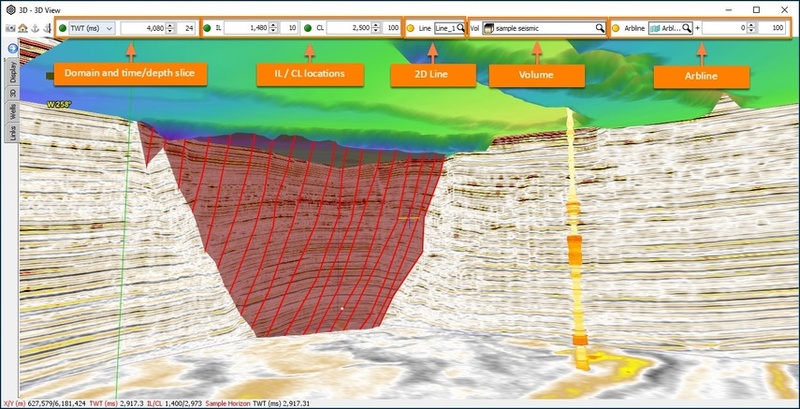 The 3D View displays seismic, horizons and other data in 3D space. When opened, it displays a plan view aligned to the X/Y coordinate system. The anchor point sits at the centre of the screen, marked by a red-yellow-blue crosshair. From the Control Panel, open the View menu and select 3D view. Each area of the Navigation bar includes a green/amber traffic light to hide or show the relevant section. The domain selector provides a TWT, TVDSS or flattened slice. The IL/CL selector shows IL/CL sections. The Line selector shows 2D lines. The Arbline selector shows an arbline. At Vol, select the volume or group to view. The enabled areas of the navigation bar will display their slice or section from the selected data volume. See Using the navigation bar in views page for more details. Take screenshot Take a screenshot of the current view and save it to an image file. Hold CTRL/CMD and click to save the image to the clipboard (see Taking Screen Captures for more details). Reset view Click to return to the original perspective. 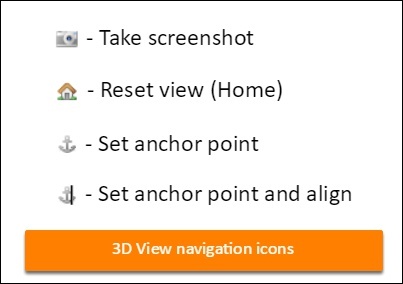 Set anchor point Click this, then click in the view to place the anchor point (rotation center) at a specific location. Set anchor point and align Click this, then click on an IL/CL, 2D or arbline section to centre on the clicked location and align the view to that section. Change (rotate) the viewing direction. Pan or slide the view (without rotating). Rotate the view to the inline plane. Press F2 Rotate the view to the crossline plane. Press F3 Rotate the view on the 2D plane. Reposition the displayed slice or IL/CL section to a new location.